2009 BJP APRIL This is APRIL's page in progress. Experimenting with some different ways to make flowers. I did get to start gardening very early this year. Both April and May are focused on that idea. I am again using the landscape technique that I learned in the February online class. I still have work to do on this one and finish the back after the beading is done. This is the 8th page in the series. Each shrine page will close with a tied ribbon and the back will have a written statement about the piece. 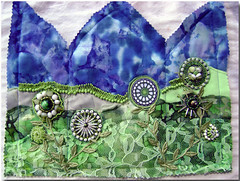 Each piece is machine quilted using a variety of printed, batik, and hand-painted fabrics, then embellished with ribbon, lace, trim and beads. The beads are glass beads in many sizes, shapes and types.